With 25 million Twitter followers, Elon Musk’s recent announcements on the launch of Tesla Models 3 and Y created a ripple effect across the world—but what did they mean for Tesla.com’s site visits? Ilana Marks and David Biegeleisen : 2019-04-09T18:42:17..
On February 28, Elon Musk announced to the world that Tesla would be offering a $35,000 Model 3, despite the general skepticism about the probability of this happening. It was a major step in Musk’s famous first master plan to bring electric vehicles to the masses. There was, and still is, plenty of scrutiny as to whether Tesla will be able to make money on this offer, especially considering its stock price volatility. 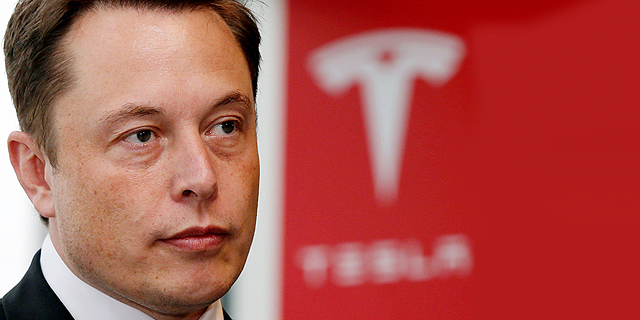 Tesla also initially announced that it was going to shift 100% of its sales online. The move had generated a major debate on whether or not it was a strategic decision or one that would lead the company to bankruptcy. Ultimately, Tesla retracted its decision to close all of its physical stores. Surprisingly, tesla.com did not see any significant changes in traffic as a result. Two weeks later, on March 14, Tesla made another groundbreaking move and announced the launch of its Model Y, with pre-orders to open on March 15. Unlike car manufacturers such as Ford, Toyota, and BMW, Tesla is the only manufacturer truly competing digitally with car-buying sites. Other manufacturers only offer the ability to build a model, get pricing options, and locate the nearest dealer to execute the sale. The fact that Tesla is the only manufacturer to effectively utilize e-commerce helps it compete not only with other car manufacturers, but also with other car buying sites. According to data from Tel Aviv-based Market Intelligence company SimilarWeb Ltd., at the beginning of February, tesla.com averaged 172,000 visitors in the U.S., behind online car dealers such as kbb.com at 637,000, cars.com at 705,000, and autotrader.com at 824,000. While its traffic was the lowest of the four, tesla.com saw a nearly quadruple increase on announcement day, which brought it only 100,000 behind the rest. On March 1, its traffic surpassed the other three sites to reach 941,000, while the rest sat below 799,000. Tesla.com also saw the best engagement on this day, at 8.5 pages per visit and a 31.2% bounce rate, compared to the other three sites that sat below 8.0 pages per visit and above a 42% bounce rate. Analysis of U.S. traffic to tesla.com against ford.com, toyota.com, and bmwusa.com showed that at the beginning of February, tesla.com averaged 172,000 visitors, ahead of bmwusa.com at 94,000, but behind toyota.com at 322,000 and ford.com at 358,000. 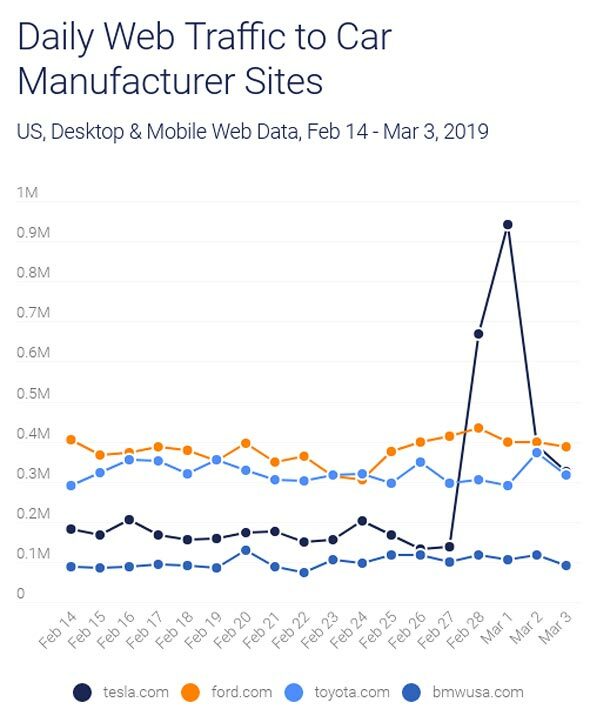 On announcement day, the times four increase in traffic had tesla.com soaring past the other three sites that remained below 435,000. 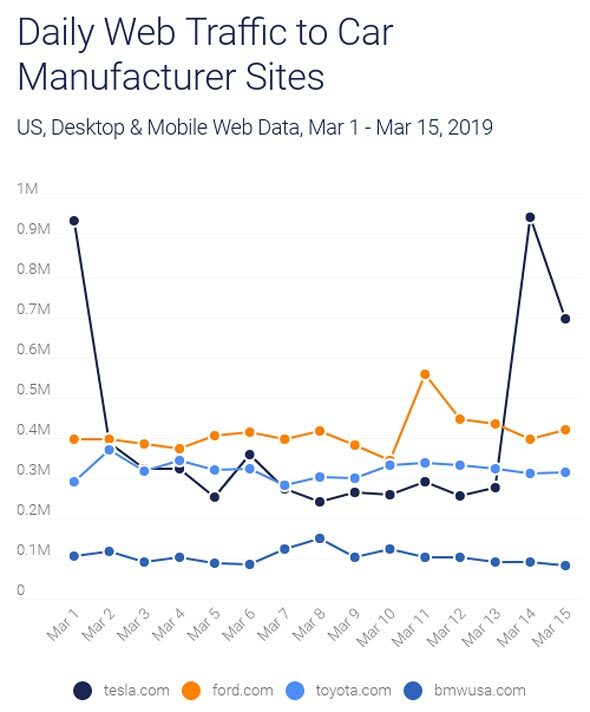 This disparity further increased on March 1, when tesla.com traffic grew to 941,000, while the other three sat below 398,000, coupled with superior engagement relative to the rest. The main sources of traffic going to tesla.com at this time were direct traffic and organic search, with almost no traffic coming from paid search. Between January and February, direct traffic increased by 25%, indicative of heightened brand awareness. The top organic keywords were also heavily branded, including tesla, tesla model 3, model 3, tesla model x, and more. This means that a majority of the website’s exposure was earned. Social media is the third largest contributor to tesla.com traffic, possibly a result of Elon Musk’s Twitter account, which boasts 25 million followers. Twitter provided the largest share of social traffic to tesla.com leading up to the announcement, at 35%, followed by Youtube, Reddit, LinkedIn, and Facebook. In January, Youtube took the lead at 38.6%, followed by Twitter, LinkedIn, Reddit, and Facebook. 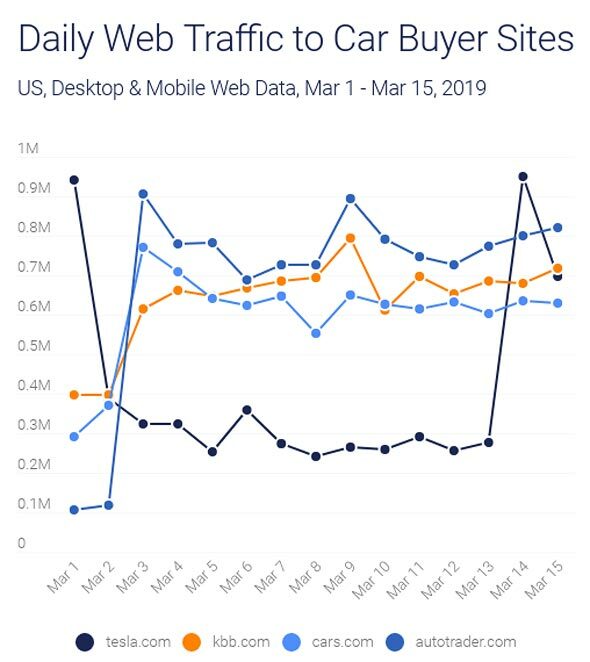 For the other three car manufacturers, paid search accounted for over 6.5% of traffic, while for the three competing car-buying sites, paid search accounted for over 4% of traffic. Contrary to the trend seen following the Model 3 announcement, the day of the Model Y announcement saw higher traffic going to tesla.com than the next day, when orders opened. The announcement of the Model Y’s release date caused traffic to more than triple compared to the previous two weeks, and more than double on the day after. The rest of the month saw average traffic drop down to 288,000, still higher than the February average prior to either announcement. From March 2 to March 14, tesla.com averaged 293,000 visitors in the U.S., behind kbb.com at 651,000, cars.com at 620,000, and autotrader.com at 722,000. 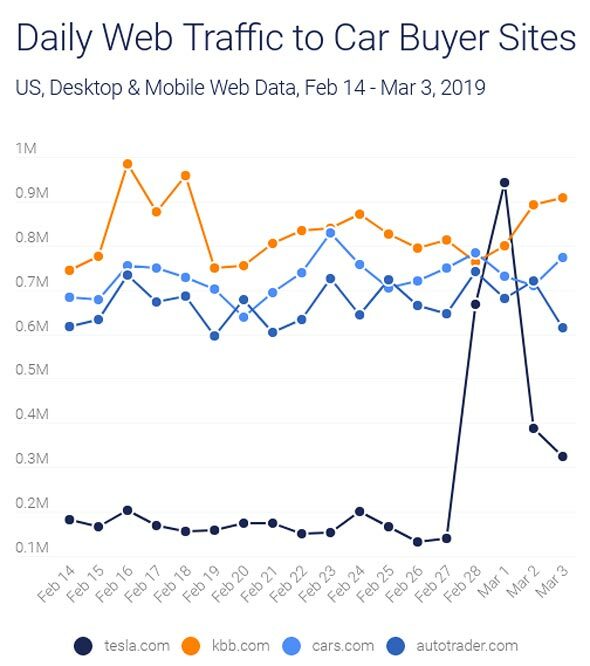 Their times three increase in traffic on announcement day had them ahead of the other three sites, with 150,000 more visitors than autotrader.com, the closest runner-up. This is similar to the trend seen for Model 3. Average visit duration was also higher than the other three sites, 06:46 compared to below 05:40 for the rest. In the U.S., tesla.com’s average of 293,000 visits between March 2 and March 14, came ahead of bmwusa.com at 107,000, but sat behind toyota.com at 324,000 and ford.com at 413,000. This also changed on the day of the announcement, when tesla.com traffic tripled to significantly outperform the other three sites, which all remained below 396,000. Average visit duration and pages per visit were also higher than the rest at this time. Following the Model Y announcement, direct visits to Tesla.com grew by 4.2%. The announcement also generated mild increases in social traffic from Twitter, Youtube, and Facebook. Despite Tesla’s stock drop and its current inability to meet delivery targets, there is an opportunity for tesla.com to optimize its growth in web traffic and drive conversion. Only time (and numbers) will tell whether these strategic launches will be rewarding. Ilana Marks is a marketing data analyst at SimilarWeb Ltd. David Biegeleisen is an entrepreneur and innovation advisor at the Swiss Embassy in Israel.